The ubiquitous self timer -- everyone has one, most forget to use it. In this episode I cover some of my favorite uses for the self timer, as well as remote releases. This simple function setting on your camera can help you get razor sharp images, even in less than perfect lighting. Las Vegas Twilight by Derrick Story. 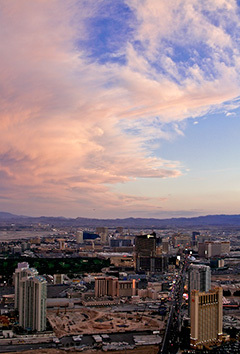 Captured from the Stratosphere at the end of the Strip using the self timer with the camera resting on a flat surface. Last month's assignment, Before & After, was so compelling I spent some time during the show discussing its results. I think there is much to be learned from the work that our club members shared.